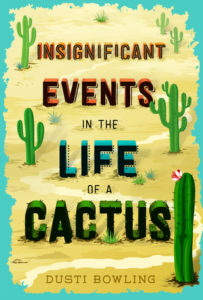 When her dad randomly takes a job as manager of an old west theme park, Aven Green has to move to the Arizona desert for the start of 8th grade. Her armlessness was never a big deal with her friends in Kansas, where she had gone to school with the same group from kindergarten on up. Now at a new large school where she doesn’t know anyone, Aven is self-conscious and the kids she encounters aren’t exactly welcoming or friendly. Can she overcome her fear, make connections with people, and follow her interests and talents, or at least stop eating lunch in the bathroom? And can she uncover the mystery of the absentee owner of the quirky theme park, to which she feels a strange growing connection? Told in an authentic, hilarious first person voice, this book is filled with life and heart. The author does a great job of showing Aven and other characters as authentic, growing people, making mistakes and learning throughout the book. It provides an empathetic and informative depiction of characters with differing abilities, helping readers understand the real challenges caused by specific disabilities as well as how little those challenges can actually limit a determined and supported person from following their interests and talents to accomplish great things. As an adult reader the story opened my eyes to ways I could improve my interactions with people of differing abilities and be a more considerate support. These are things I wish I had learned at a much younger age so I feel this could be an important book for young people to read. It’s an extremely engaging, easy read that kids will want to pick up anyway. Highly recommended for young people as well as teachers and parents of young people. • This book has a similar vibe to Wonder, but is lighter and funnier, without a central bully-villain. It’s a very accessible realistic/contemporary fiction story. • Could be a good next step for fans of humorous diary books like Wimpy Kid or Dork Diaries. It doesn’t have illustrations but it is told in first person and it includes funny entries from the character’s blog. • The quirky theme park mystery element has a similar vibe to small town stories by authors such as Sheila Turnage and Natalie Lloyd. I loved this book and have been recommending it to many students! Thanks for the review – we can’t wait to get this book for our library! I loved this book as well. I hope this makes it to the Beehive list.